Super Bright 20 LED Lights The solar light is super bright and covers a wide area with a strong illumination. Equipped with 20 LEDs, it is much brighter than other similar solar lights. Two Sensitive Motion Sensor Modes with Strong Sensor Ball head This solar light has updated PIR motion sensor and become more powerful. It can detect motion up to 26 feet away. Also it has two motion sensor modes for this solar light. 1. Full-on mode. From sunset to sunrise, the solar light will remain on and at full brightness (charge this should be from 8-10 hours). The solar light will automatically turn itself off at daybreak. 2. Reduced light mode. After sunset, the solar light will remain on, but at a reduced brightness. 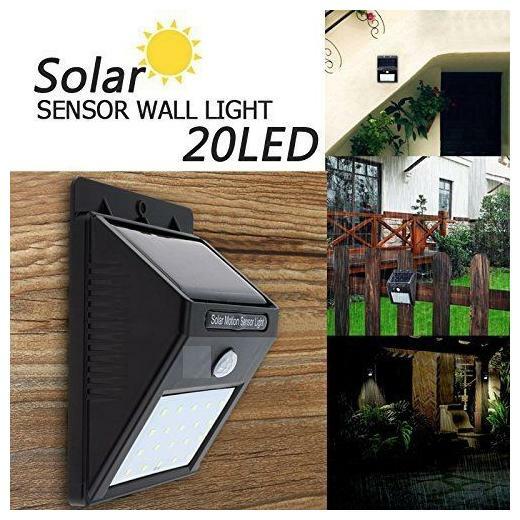 When movement is detected by the motion detector the solar light will automatically go to full brightness and remain there for 15 seconds, then the light will automatically return to reduced brightness.